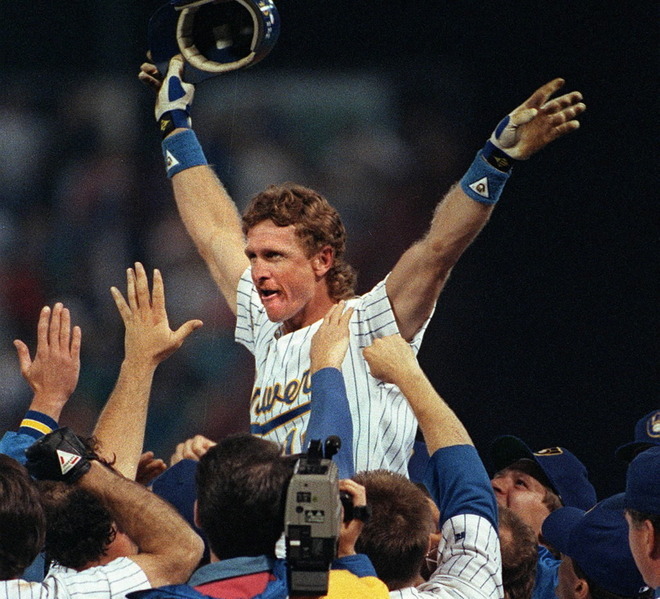 Robin Yount said on the leadup to his 3000th hit that it wasn’t going to be a big deal. 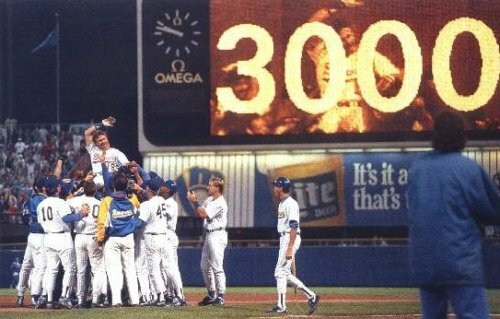 The man who took more pride in his Milwaukee Brewers winning ballgames than personal stats found out he was wrong – the 3000 hit plateau was a huge deal. On September 9, 1992, a crowd of 47,589 packed Milwaukee County Stadium to see history made when Yount became the 17th MLB player to reach the mark. He tied Roberto Clemente for 16th on the list. Yount admitted that he finally had gotten caught up in the pressure to get the historic hit at home. The Brewers were about to embark on a road trip that wouldn’t bring them back to Milwaukee until September 18. Yount had already faced Cleveland starter Jose Mesa three times on the night and failed to get the hit. He had struggled in his career against Mesa, going 1-13 in his previous at bats. 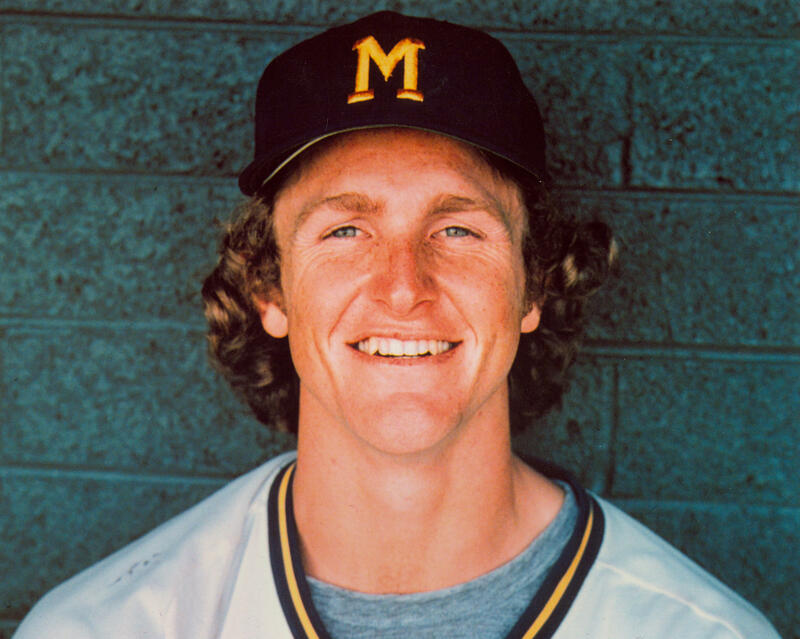 Yount’s teammates quickly joined him at first base in joyous celebration, hoisting him on their shoulders as a brief biography played on the scoreboard. The crowd also celebrated and gave Yount a ten minute ovation. Paul Molitor and Jim Gantner were rightfully among the first to reach Yount after the hit. Yount’s good friend George Brett applauded in the Kansas City Royals dugout when video of the hit played on the Royal’s stadium scoreboard. Yount had already told reporters that if not for Brett’s bad knees, he would have reached 3000 hits first (Brett was 22 hits behind Yount in their careers). He felt that Brett was a far better hitter. Yount happened to be a week shy of his 37th birthday, and that put him in an elite class. Only Yount, Ty Cobb (at age 34) , and former teammate Hank Aaron (at age 36) reached 3000 hits before their 37th birthday. All-time hit leader Pete Rose reached the mark 21 days after his 37th birthday. 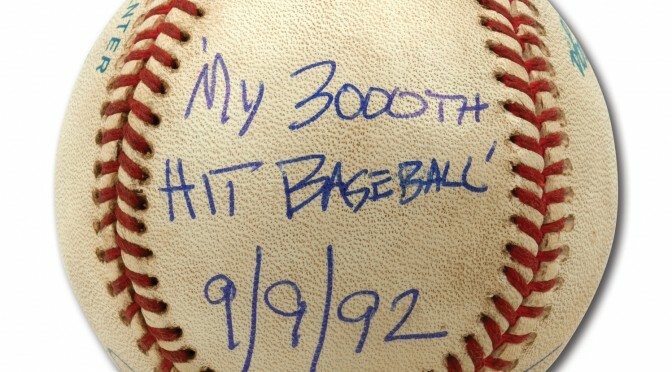 Derek Jeter got to 3000 just 13 days after the birthday. Yount also found himself alongside Willie Mays as the only players with 3,000 hits, 200 home runs, 200 stolen bases and 100 triples. A few days before the Cleveland game, Yount told reporters that longevity, consistency, and being relatively injury-free put him in place to make history. Despite Yount’s special hit, the Brewers went on to lose the game 5-4 after reliever Darren Oliver threw the ball away for an error in the ninth inning, which led to the tying and winning runs scoring. Yount actually lined out to end the game. Milwaukee fell 5.5 games behind Toronto after the Blue Jays picked up a 1-0 victory over Kansas City. The Brewers went on to finish with a 92-70 record, four games behind the Blue Jays. As for Yount, he played one more season before retiring early in 1994. The Brewers retired his jersey No. 19 that season. In 1995, he was inducted into the Wisconsin Athletic Hall of Fame. In 1999, he entered the National Baseball Hall of Fame on his first ballot. Yount’s 3142 hits are a Brewers record. He also has Brewers career records for games, at-bats, runs, doubles, triples, RBIs, total bases, walks and strikeouts. In 2016, Yount auctioned off 71 items from his personal memorabilia collection, including the bat used to get hit No. 3000 and the ball. The 71 items fetched just under $200,000 with the bat and ball coming in at the highest marks – the bat sold for $48,841 and the ball $34,176. The bat and ball were signed and inscribed.